When I first got hold of the Key label’s Alive! compilation I was unaware of any of the artists having full-length albums available. Well the British male folk trio Glorylanders (with their two guitars and one upright bass) had at least three to their credit and they’re all excellent. The trio consists of Bill Simmons, Arthur Pemberton and Ian Moore. Their robust energetic style emphasizes tight harmonies, crisp 12-string guitar and moving melodies while echoing mid-’60s pop-oriented groups like The Seekers (minus Judith of course), with arrangements and clarity of sound that are on the level of the major labels. Their debut includes titles such as ‘Have You Ever Wished?’, ‘The Rainbow Song’, ‘For Me To Live’, some Judy MacKenzie songs (‘If I Tried’, ‘That’s How It Is’ and ‘Jesus Came’), plus a few originals. 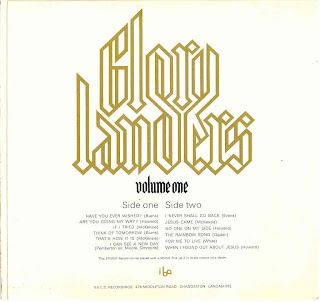 The group had some early EP releases containing songs from this album. (The Archivist, 4th edition by Ken Scott). I’ve been looking for a clean copy of this album for years. I grew up listening to this album because my parents always had it on. Now to have it again has brought back a lot of great memories.